Bruce Sterling was, with William Gibson, one of the leading members of the ‘Mirrorshades’ group of SF writers, who launched cyberpunk in the 1980s. This is the SF genre set in dystopian, corporate futures, whose streetwise picaresque heroes entire a VR cyberspace through jacking into the Web. If you want an idea what the genre’s like, see the film Blade Runner, although the film actually came out while Gibson was writing his groundbreaking novel, Neuromancer. This week the news has been dominated by hurricane Harvey and the other storms that are wreaking such havoc in Florida, Bermuda and other parts of the Caribbean. In a previous article I put up this evening about Trump’s appointment of Jim Bridenstine, a scientific illiterate, who doesn’t believe in climate change as head of NASA, I discussed how Jimmy Dore and his co-host Steffi Zamorano and Ron Placone had said that these storms bear out the continuing decline of the Earth’s climate. Way back in the early part of this century, after several heatwaves, climate scientists warned that climate change meant that the weather would become more extreme. 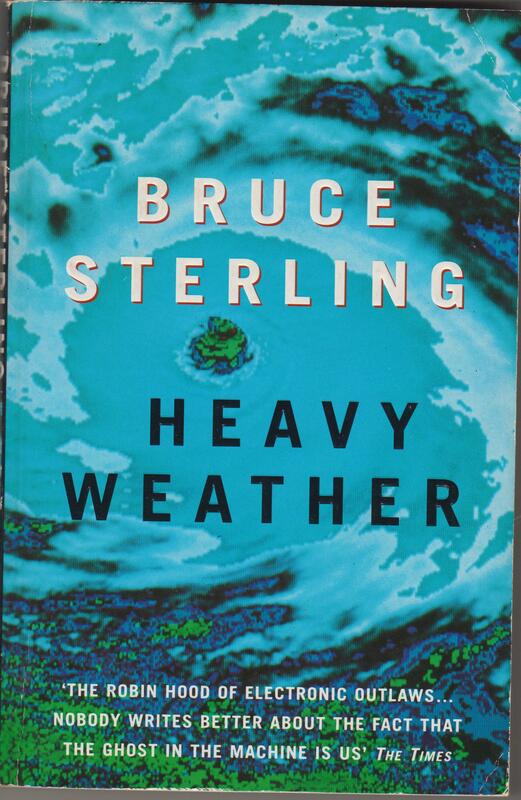 And Bruce Sterling wrote an entire book about the superstorms that would arise due to climate change in his 1994 SF novel, Heavy Weather (London: Millennium). 2031 – the atmosphere’s wrecked. The Storm Troupers – media unit, scientists, techno-freaks – get their kicks from weather. Hooked up to drones through virtual-reality rigs, they can plunge like maddened darts into the eye of a storm and surf a ride from hell. Their Holy Grail: the F6, a tornado so intense it’s off the scale. Dangerous in the extreme. Also dangerous: certain people’s sick dreams, full of tornado trails, shining insane paths of endless howling destruction. The high-tech wonders of a decaying world … and a bunch of wild nomads longing to be blown away. I think the book was a response by literary SF to the film Twister, about a group of meteorologists chasing tornadoes across the southern US, starring Piers Brosnan. I don’t think we’ve quite reached the level where masses of Americans are being left homeless in refugee camps, nor are their groups quite like the Storm Troupers. But these violent storms are becoming a reality, and will become ever worse as the climate deteriorates. As Max Headroom used to say in his trailers for Channel 4: ‘The future…is now’. And it’s disgusting that Trump’s trying to close down climate research, and put in charge of NASA someone who knows precious little about science, and doesn’t believe in climate change.